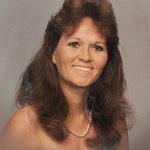 Frances Regina Nottingham, 59, of Granbury, Texas passed away on Sunday, January 14, 2018. Service: 11:00 am Saturday, January 20, 2018, at Martin’s Funeral Home Chapel, Granbury. Interment: Holly Hills Memorial Park. Frances was welcomed into the home of Luther and Irene Felkon Taylor on February 9, 1958 in Dallas, Texas. She had three children and worked as a dental assistant. Frances will be missed by all who knew her. She was preceded in death by her parents. Survivors: Son Robert Nottingham, Jr.; daughters Tabitha Porter and Tamra Webb; stepson Nathan Helm; stepdaughter Brittanie Helm; grandchildren Dagon Brewster, Daylon Webb, Daylee Nottingham; Rease Porter and Kamry Nottingham; husband Daryl Helm; sisters Connie Sue Russell, Kathy Pauline Savage and Sharon Hanby; brothers Luther Dale and Henry Don Taylor and numerous nieces and nephews.